90 ball bingo games are the most popular variation of online bingo in the UK. 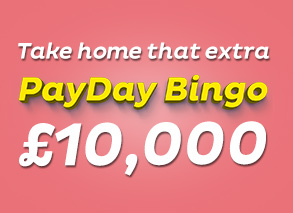 It’s the most common form of bingo played in live bingo halls and therefore also a player favourite online! One of the best features is that there are 3 winning patterns so your chances to win are much greater! Since 90 ball bingo odds of winning are greater than other varieties, you won’t want to miss out playing at Loony Bingo! The rules how to play are pretty simple and straightforward. Buy your bingo cards and head to one of Loony’s many 90 ball games. The cards display a grid of 3 horizontal rows and 9 vertical columns with differing numbers determined for each column. The 1st contains number 1-9, the 2nd 10-19, the 3rd 20-29 and so on. Each of your cards come filled with 15 randomly placed numbers. The caller will call out a number from 1-90 at random and if it appears on your card, you need to daub it (or use auto-daub). The first players fill 1-line, 2-lines, or Full House patterns will win! The size of the prize depends on the game, with jackpots bursting at the seams! Where to play 90 ball bingo? Sweet Wins and Mighty 90 are just two of our 90 ball live bingo rooms with chat rooms where you can mingle with Loony roomies and play extra games to boost your winnings! See you there!